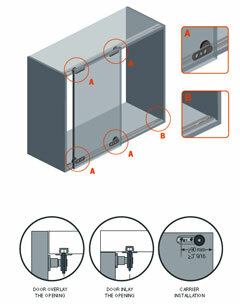 4 Points sliding system for inline wood or aluminum doors installed inlay or overlay the opening. Ideal for furniture applications. When inlay 2 tracks can be installed for bypass door travelling. The external door can be overlay the opening.